I wouldn’t categorize The Loxahatchee Lament as a “beach read” and I’m pretty certain the Palm Beach County Library system wouldn’t appreciate you taking it anywhere near a body of water, but if you are curious about the history of Jupiter and northern Palm Beach County, I recommend you head to your nearest library branch to check out a volume. A map of Jupiter/Tequesta drawn for the Jupiter/Tequesta Chamber of Commerce by Ives M. Cary and featured in The Loxahatchee Lament. This same map hangs in the guest room at my parents’ house. However, what started out as a quest to save the river soon became an oral and written history of the town. 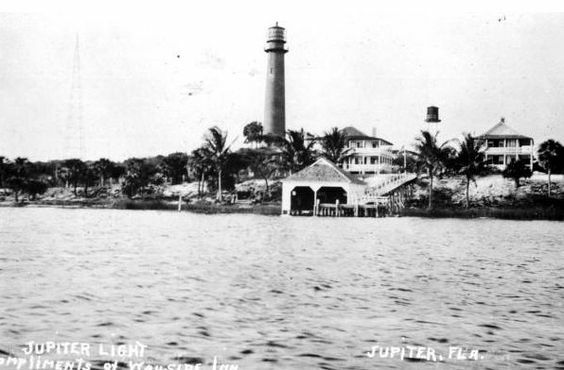 Jupiter pioneers who arrived in the early 1900s battled mosquitoes, the Great Depression, and the 1928 hurricane. It was impossible to travel over land; almost everyone used the Loxahatchee River for transportation. At the time of publication in 1978, those same pioneers now lived in air conditioned homes near modern grocery stores and doctor’s offices, all on paved roads. With over 100 interviews, readers can discover the Jupiter of the past, when our tiny town was just a beacon in the wilderness (literally). Pennock Plantation was established in 1895 by Henry S. Pennock, a Philadelphia florist and engineer who moved to Jupiter to grow asparagus ferns in the warm weather without the use of a hothouse. The ferns were very popular in floral displays in the north and Mr. Pennock soon became the area’s largest employer. The only photo I could find of the fern sheds at Pennock Plantation. If you have a better one, I would be so grateful if you could email it my way! By the mid-1950s, ferns were no longer in high demand and the Plantation downsized. All remaining buildings were destroyed in a fire in 1970. Today, the Jupiter Plantation apartments sit on the former site of Pennock Plantation. I wrote about Jupiter’s school boat in a post earlier this month about Old Jupiter School. There was very little infrastructure in the Town of Jupiter and the dirt roads were mostly unnavigable (besides the fact that the majority of residents were too poor to own an automobile). The easiest way to get children to school was to take them by boat via the Loxahatchee River. I’m pretty certain this practice is illegal now in Florida due to that fact that the method can easily wipe out a fish population (someone please correct me if I am wrong), but here’s an explanation from a November 6, 1958 article in the St. Petersburg Times: “Fire fishing, a name dating back, some say, to ancient man’s use of flaming torches for night fishing, is modernized to include those who gig fish in shallow waters under a bright, gasoline lantern that supposedly attracts and blinds fish.” Jupiter pioneers recall that the river was so thick with mullet that, if you happened to be on the riverbank during a full moon, the surface was continuously broken from the lighthouse to the inlet by jumping fish. I had absolutely no idea that there were (and maybe still are) oysters in the Loxahatchee River. Nowadays, you wouldn’t want to eat one because of the run-off and pollution from golf courses, lawns, and our roads. The dock at the Carlin house in 1934. Under the dock, looking like a pile of rocks, are fresh oysters from Peck’s Lake kept alive until needed for the table. Yes, the job of the lighthouse keeper is one of the many careers that have been phased out in the name of technology. In 1928, the light was electrified and a 1/3 horsepower motor turns the lens carriage. Since 1987, a photoelectric cell turns turns the bulb and motor of the light on when the sun sets and off when the sun rises. The broken Bullseye lens at the Jupiter Inlet Lighthouse. The tour guides still point it out to this day if you are brave enough to take the climb to the top. I can’t imagine climbing the lighthouse in the middle of a hurricane – absolutely terrifying. Thanks for fowarding! If you enjoyed this post, thank you for taking the time to share it with others who may also like reading about Jupiter, Florida. You make my day! Next No Labor. No Hurricanes. No Worries.